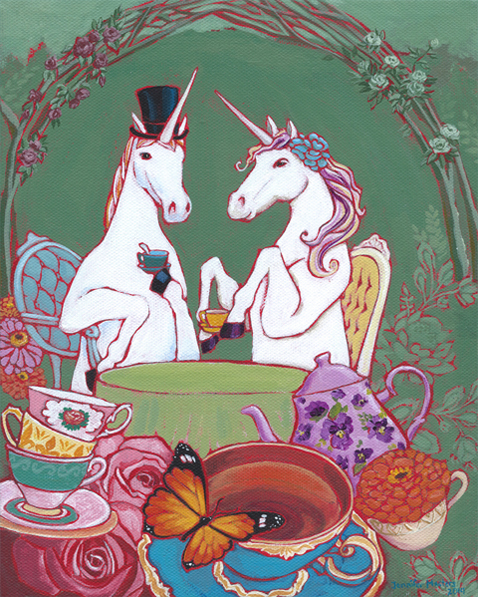 I was helping put together a fundraiser event for Passion Fruit Project; The Unicorn Tea Party. 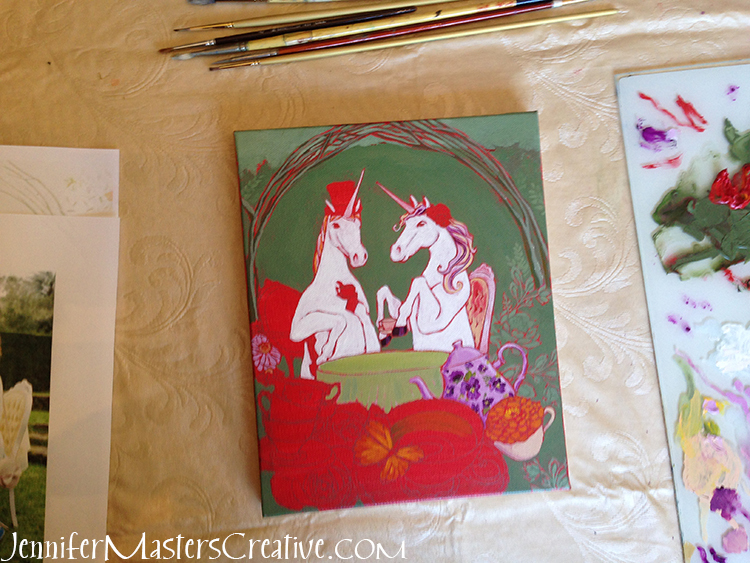 I’ve loved unicorns since I was a little girl, and the idea of a unicorn tea party sparked joy in me! I was asked to create an event flyer and it was suggested I use a simple piece of clipart, like a unicorn with a cup of tea. I was immediately inspired to create the painting you see here. A fancy painting was by no means required for the task, I just wanted to do it! It came together quite fast, four days total, from researching horse anatomy, to the first sketches, to photographing the finished painting. I wanted the feel of a fun and fantastical collage. It wasn’t intentional that it has an “Alice’s Adventures in Wonderland” vibe going on, but I quite like it. My “easel” is this old vinyl tablecloth I inherited from my grandma. Back when I had a real easel, I didn’t really use it. If I did, it was usually just something to prop the back of the painting against, when holding it in my lap. I tend to move and tilt the canvas all over the place as I work.